The Dragon cargo capsule docked at the International Space Station (ISS) today, and Canadian astronaut Chris Hadfield documented its arrival with some stunning photos. The Dragon launched Friday and experienced difficulties with its thrusters, the Associated Press reported, but the capsule was successfully captured above Ukraine. The crew on the ISS used Canadarm2 to "catch" it, Hadfield Tweeted. "The Dragon is ours! Manoeuvring it now on Canadarm2 to a docking port, will open hatches once secure," he wrote. The capsule carried items such as mouse stem cells, clothes, computer equipment, batteries, tools and more, according to the Associated Press. Hadfield said it also had peanut butter, fresh fruit and notes from friends. 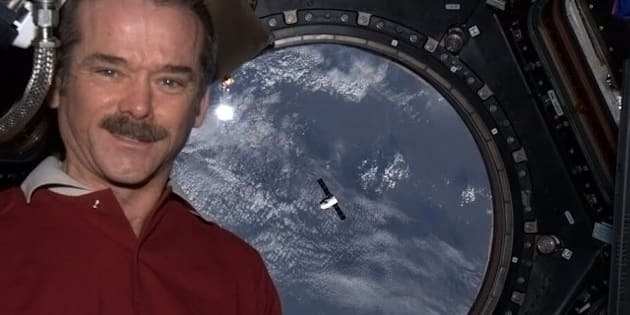 The Canadian astronaut arrived at the International Space Station in December and has interacted with fascinated Earthlings via social media ever since. Hadfield said the Dragon capsule will next be repacked with "experiments and hardware for splashdown in the Pacific."